This past weekend, I made a decision. I’ve put up my first Christmas tree of my own. I should say, “of our own,” as Boyfriend helped me pick it out and decorate it. 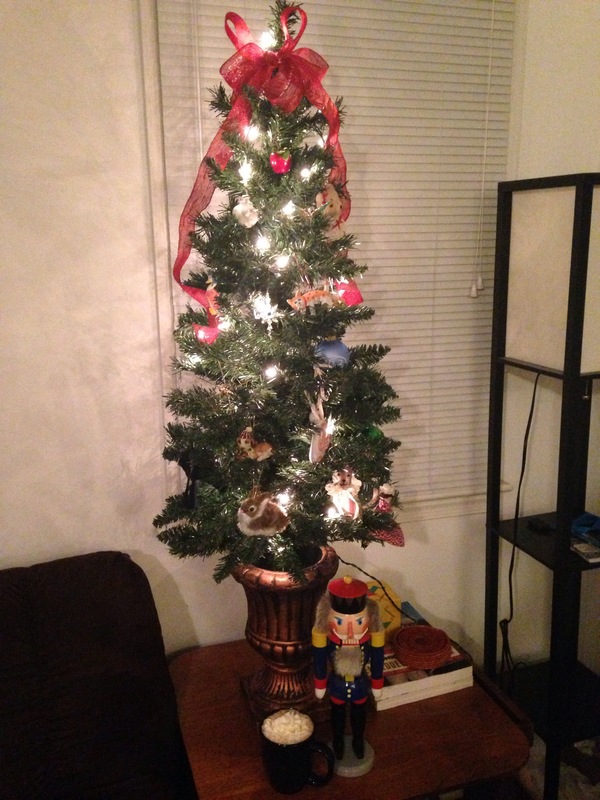 We decided on a fake tree to appease our housemate, and reduce the maintenance a real tree can require. We found this little guy, really an outdoor tree, at the Home Depot. He’s just big enough to hold a few of my favorite keepsake ornaments. Then, Boyfriend and I went to my mother’s house to pick through her Christmas box and take the ornaments with particular sentimental value, mostly ones that I was given as gifts over the years. There are the stuffed animals, such as the cat a good friend in grammar school made me, and the little bear I shoplifted when I was 2. And there are the animals, mostly cats for me and reptiles for my sister. There are my ballet slippers, from the few years I danced ballet, badly, as a young child. It has “To our best ballerina” written on the back, but that was before my sister came along and bested me in all forms of rhythmic movement. Since we don’t yet have a topper, my mom tucked a roll of repurposed red ribbon into the box with the ornaments and I used it to fashion a makeshift tree topper. And my nutcracker, given to me not by Santa, but by Godpapa Drosselmeyer when I was a girl, stood watch over the whole thing. With cocoa and port and Christmas music, it made for a lovely holiday evening.